The body is systemic—every piece of it works in combination to make all the other parts work properly. So, physical health and psychological health must combine in order for optimal health to be achievable. As such, it is not so surprising that heart disease and depression can create a cyclical problem: not only is depression likely to crop up following a diagnosis of heart disease, but battling depression can actually increase the chances of heart disease. Depression is a complex disease that comes in many forms, but ultimately it consists of a chronic or persistently depressed mood that interferes with everyday activities. It is not uncommon for psychological depression to crop up following a diagnosis of a serious illness. Feelings of helplessness and an inability to cope with the seriousness of the disease combined with guilt, doubt, and uncertainty can be a recipe for disaster. Heart disease is no different. Nearly 20% of heart attack and heart failure patients are estimated to develop depression as well. While experts think that some patients may have had undiagnosed depression symptoms before their heart disease diagnosis, it is possible that developing such severe illness may create the onset of depression, although this is difficult to prove. Furthermore, the presence of depression can make recovery more difficult. Research shows those who approach recovery and management with a positive attitude are more likely to follow new diet plans, change their lifestyle for the positive, and perhaps most importantly, feel confident in their ability to manage the disease. On the other hand, patients with depression may in fact be more likely to develop heart problems. Stress and anger are recognized risk factors for heart disease, and depression tends to create stress in the body. This can lead to high blood pressure, which causes cardiovascular damage all on its own. According to Johns Hopkins Medical Center Professor Dr. Roy C. Ziegelstein, not only do “a percentage of people with no history of depression become depressed after a heart attack or after developing heart failure,” but “people with depression but no previously detected heart disease seem to develop heart disease at a higher rate than the general population.” Additionally, the Cleveland Clinic states that heart disease risk factors may result from depression; platelets may clot more easily, “decreased heart variability and increased proinflammatory markers” may also be present more often. 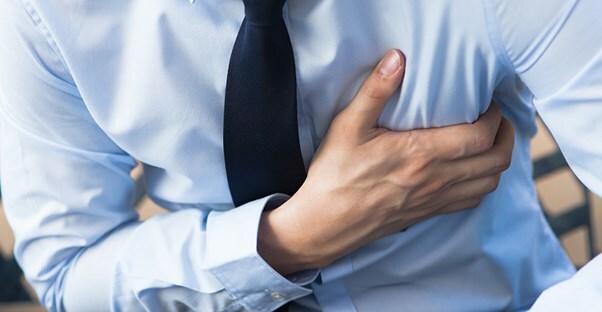 Other risk factors may also be present more often in depressed patients, who are more likely to smoke cigarettes, develop addiction problems such as alcoholism, be more sedentary, and eat worse—all of which are also risk factors for heart disease. The lack of social support may be more frequent among depressed patients as well. In those who tend to remain sequestered and have fewer friendships and other forms of social support, not only can depression be worse, but so can heart disease. Taking part in rehabilitation clinics as well as seeking other means of support can help dramatically.